As a part of celebrations of the fifth blogging anniversary of Narayankripa, earlier I posted a poem on memories of my Gurudeva and a prayer to Him on completion of 5 years of Narayankripa. Today’s post and the poem is dedicated to you, all the readers, and friends. In the blogging terminology, visitors are generally called as traffic and I think, that’s not a perfect term. I don’t like the word ‘traffic’ for real human readers. Readers are rather friends of writers who encourage, motivate, and criticize. I would like to 'Thank You All' from the core of my heart for making this journey so beautiful and unforgettable. 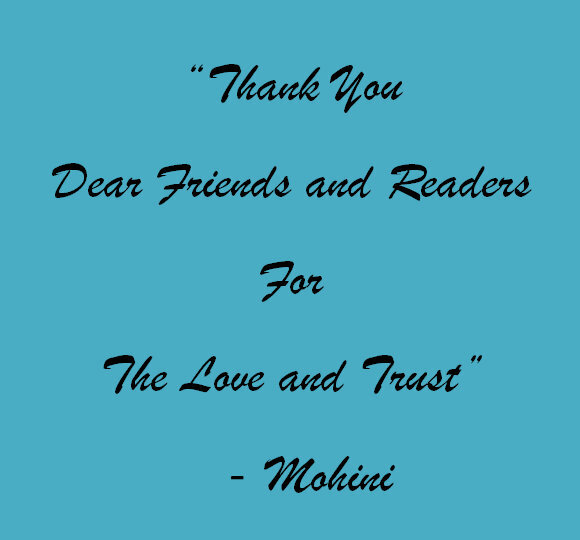 Every blog post is special for me and so as your feedback, your visits, and your reading. Every reader is equally important to me and I am grateful that you give your precious time for reading, commenting my poems and articles. Blogging is not just about writing; the most amazing experience of the journey is meeting amazing people all over the world. I have been so fortunate to have a positive and encouraging community of friends around me, my blogging friends, my Facebook and Twitter friends, all of you. The most common response I have received so far is that while reading Narayankripa poems you discover peace. Yes, it’s Narayankripa, if you feel so. I also feel the same way while writing. I can not mention anyone of you individually; it's really difficult. But, I miss the old days when we all used to have interactions in blogging and Facebook communities. Merely thanking you isn’t enough, but I think you will agree with me that heartfelt words are the most beautiful.